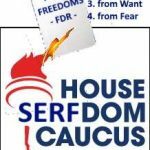 What claim does the House Freedom Caucus have to the word “freedom?” Measured against FDR’s four freedoms, the word “serfdom” seems more fitting. FDR: In the future days, which we seek to make secure, we look forward to a world founded upon four essential human freedoms. The first is freedom of speech and expression – everywhere in the world. The second is freedom of every person to worship God in his own way – everywhere in the world. The third is freedom from want – which, translated into world terms, means economic understandings which will secure to every nation a healthy peacetime life for its inhabitants-everywhere in the world. The fourth is freedom from fear – which, translated into world terms, means a world-wide reduction of armaments to such a point and in such a thorough fashion that no nation will be in a position to commit an act of physical aggression against any neighbor–anywhere in the world.